Advance is a Web Extension that works by analysing content you’re into right now in order to provide recommendations based on what you may want to “Read Next” through a sidebar in the browser. For example, you’re just browsing the internet, and come across a page with a list of the hottest restaurants. 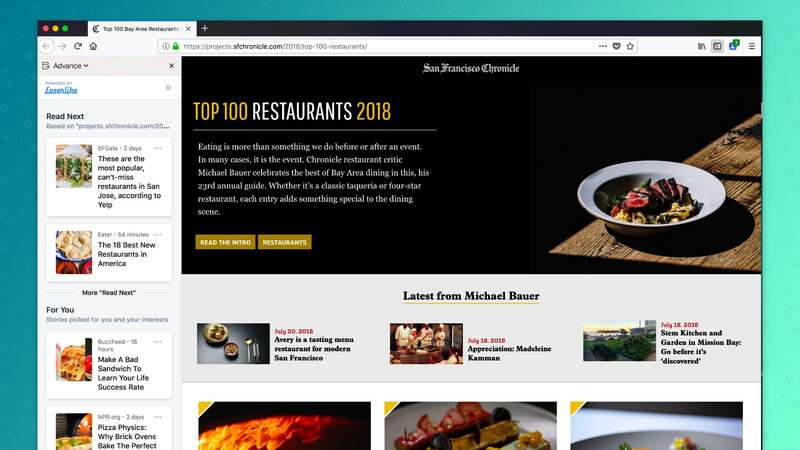 Advance starts to recommend similar content around the most popular restaurants so that you can start comparing without having to do all the research on your own. These are based on the trusted sites you’ve already visited, new sites are recommended for you to explore. If there’s a recommendation you don’t want, you have the option to flag it as “Not interesting, off topic/spam, block sites,” or give direct feedback. The recommendations are personalised for you. The Advance experiment is available for download on Test Pilot and powered by Laserlike, a machine learning startup that has built a web scale Content Search, Discovery and Personalisation platform. It enables content discovery based on web browsing activity and getting diverse perspectives on any topic. At Mozilla, we believe browser history is sensitive information and we want people to clearly understand that Laserlike will receive their web browsing history before installing the experiment. We have also included controls so that participants can pause the experiment, see what browser history Laserlike has about them, or request deletion of that information. We’re interested in seeing how our users respond to their browsers having a more active role in helping them explore the web, and we’ll experiment with different methods of providing these recommendations if we see enough interest. The Test Pilot programme is open to all Firefox users. Your feedback helps us test and evaluate a variety of potential Firefox features. We have more than 100,000 daily participants, and if you’re interested in helping us build the future of Firefox, visit testpilot.firefox.com to learn more.